Lock in a great price for Mitsui Garden Hotel Kyoto Shinmachi Bettei – rated 8.8 by recent guests! - Really friendly hotel staff - took their time to say hello everytime you passed the desk! They provided some recommendations for restaurants but they were either closed or quite hard to find - The lobby area and general hotel is modern, distinctive and really nice - The 'naked spa' was cool - Room had a pretty comfortable bed and the bathrooms had a good shower and robot toilet! Loved this hotel and location. Very convenient walk to Nishiki Market and lots of other main sights. Close to subway and bus stops. Fast taxi rides elsewhere (like train station etc). The hotel itself is spotlessly clean and the staff was very friendly. Added bonus was the adorable kids amenity kit we were greeted with upon arrival (slippers, toothpaste/brush and washcloth). The lobby had a lovely scent. The beds were a bit hard but the pillows good (in comparison to other flat pillows we experienced in Japan). We would stay here again without hesistation. Great location, friendly accommodating staff, comfortable room! Place is great and food at the hotel restaurant is great !!! The breakfast is excellent.... !!! We had dinner also and it was very satisfying !!! Lovely atmospheric small to medium sized hotel. Fabulous staff. Lovely scented entrance and lobby. Superior room compact but fine for a couple traveling light (no big rolling suitcases!). Great value. Cycle rental right next door for exploring. Nothing not to love. Plenty of eateries and shopping within an easy stroll. 10/12 minute walk to the food market and shopping area. Staff were very attentive and language ability was very high. Bags can be stored before check-in. Room was nicely designed and temperature well controlled. Hotel had a great ambience, very peaceful. This is one of nicest hotels we have ever visited. The facilities are outstanding (room, bathroom, public bath) and the staff goes above and beyond to help. We also love this location in Kyoto. Easy walking distance from pretty much anything you'd want (other than Gion which is over-rated and expensive). A gem of a hotel in a quiet residential neighbohood of Kyoto. Tastefully furnished in Japanese modern style. Comfortable room with all amenities. Great hot tub. I liked the amenities of the slippers and pajamas. The location of the hotel was perfect and many restaurants are in walking distance and Kyoto station wasn’t very far for the day trip to Hiroshima. The separated bath house was also a plus and of course the staff were very helpful. Mitsui Garden Hotel Kyoto Shinmachi Bettei This rating is a reflection of how the property compares to the industry standard when it comes to price, facilities and services available. It's based on a self-evaluation by the property. Use this rating to help choose your stay! One of our top picks in Kyoto.Opening in March 2014, Mitsui Garden Hotel Kyoto Shinmachi Bettei offers accommodations with a modern yet traditional décor. Free Wi-Fi is available at the entire property and guests can refresh in the public bath. Shijo and Karasuma Station are both within a 10-minute walk away. The air-conditioned rooms feature comfortable Serta beds and a flat-screen TV with VOD channels. An electric kettle with green tea bags is provided in each room. Bath amenities including a toothbrush set are provided. The private bathroom comes with a hairdryer. A coin-launderette is on site, while dry cleaning services are available as well. The 24-hour front desk offers photocopying services and luggage storage. Drink vending machines are on site. Guests can request massage services at an additional charge. 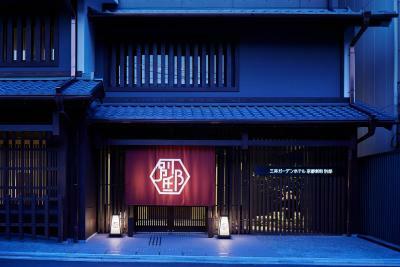 The restaurant serves a Japanese breakfast in a traditional modern decor. Meals feature local ingredients including Kyoto vegetables. Shinmachi Bettei Kyoto Mitsui Garden Hotel is a 15-minute walk from Nijo Castle and a 5-minute drive from the Kyoto Imperial Palace. JR Kyoto Station and Kiyomizu Temple are both within a 10-minute drive away. When would you like to stay at Mitsui Garden Hotel Kyoto Shinmachi Bettei? This air-conditioned room features a comfortable Serta bed and a flat-screen TV with VOD channels. An electric kettle with green tea bags is provided in each room. The private bathroom comes with a hairdryer. Bath amenities including a toothbrush set are provided. The windows in this room does not open. In addition, the windows are opaque and offer no views. This air-conditioned room features comfortable Serta beds and a flat-screen TV with VOD channels. An electric kettle with green tea bags is provided in each room. The private bathroom comes with a hairdryer. This room has 2 single beds placed side by side, making a double bed. Bath amenities including a toothbrush set are provided. More spacious air-conditioned room featuring comfortable Serta beds and a flat-screen TV with VOD channels. An electric kettle with green tea bags is provided in each room. The private bathroom comes with a hairdryer. Bath amenities including a toothbrush set are provided. Most spacious air-conditioned room featuring comfortable Serta beds and a flat-screen TV with VOD channels. An electric kettle with green tea bags is provided in each room. The private bathroom comes with a hairdryer. Bath amenities including a toothbrush set are provided. Comes with 2 single beds and 1 extra bed. More spacious air-conditioned room featuring comfortable Serta beds and a flat-screen TV with VOD channels. An electric kettle with green tea bags is provided in each room. The private bathroom comes with a hairdryer. Bath amenities including a toothbrush set are provided. The windows in this rooms does not open. In addition, the windows are opaque and offer no views. This air-conditioned room features comfortable Serta beds and a flat-screen TV with VOD channels. An electric kettle with green tea bags is provided in each room. The private bathroom comes with a hairdryer. Bath amenities including a toothbrush set are provided. This air-conditioned room features a comfortable Serta bed and a flat-screen TV with VOD channels. An electric kettle with green tea bags is provided in each room. Bath amenities including a toothbrush set are provided. The private bathroom comes with a hairdryer. House Rules Mitsui Garden Hotel Kyoto Shinmachi Bettei takes special requests – add in the next step! Mitsui Garden Hotel Kyoto Shinmachi Bettei accepts these cards and reserves the right to temporarily hold an amount prior to arrival. Please note that room windows do not open. Room windows are opaque, not offering outside views.